Slinking down a dark corridor, illuminated only by the glow of soft candles and dry ice, Maila Nurmi makes her grand entrance. In the unlikely event that her seductive gaze failed in seizing your immediate attention, there is no doubt that her skin tight black dress, accenting the quintessential “wasp” waist, certainly would. Little did Los Angeles viewers of local channel, KABTV, know it at the time, they were not just witnessing the debut of Vampira but the birth of the American horror host. While the Finnish beauty stood alone in 1954, there were easily over 100 active horror hosts (including commercial television, cable, public access, and Web) at the time of her death in 2008. Although her tenure was relatively short, her contribution to television can not be overstated. Whether you’re in Chicago (like myself) tuning into Svengoolie every Saturday night, howling with Wolfman Mac in Michigan, or holding your sides from laughter while watching Zomboo in Reno, you are enjoying the fruits of Vampira. In March 2010 a cavalcade of grateful, modern hosts descended upon the Indianapolis Horrorhound Convention to pay tribute to this remarkable woman. For me, the timing could not have been better. It wasn’t long ago that I had been under the false impression that Svengoolie was the only horror host still active today. This past year I was able to experience the work of numerous others from across the country. They include men, women, vampires, witches, werewolves, and mad scientists. Horror hosting, it would appear, is the ultimate equal opportunity job. Some are creepy, some hilarious, and all are quite unique. Learning about them was not only fascinating but also highly entertaining. The majority of horror hosts today are comprised of passionate individuals, taking their love of horror films to the “next level.” They return from their day jobs only to don make-up and adopt a clever alter ego. They are often joined by an attractive assistant, with their best friends acting as film crew. These dedicated folks air their shows via public access television. They can often be seen doing interviews at local conventions and eagerly selling the fruits of their labor. I always try to support them whenever I can which is probably why I now have over ten different versions of THE GIANT GILA MONSTER. The rise of corporate television, and consequent near extinction of local channels, has all but killed the “classic” horror hosts that many of us were fortunate to grow up with. These are the ones that cause older fans, like myself, to develop lumps in their throats and become weepy with nostalgia at the mere mention of their names. Some have managed to survive the odds and are still standing today. They are the rarest and most influential in the horror host realm. 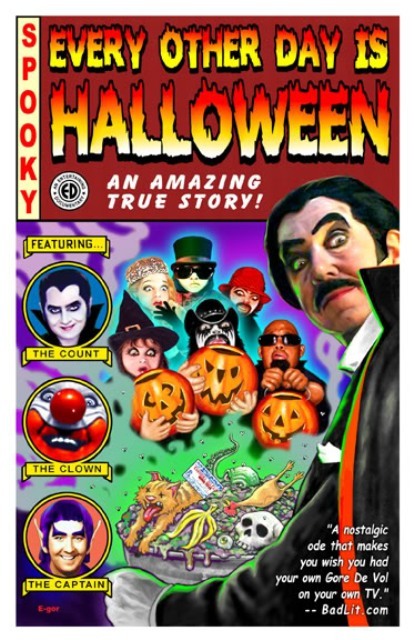 They would include such titans as Svengoolie, Zomboo, and Son of Ghoul. Like their predecessors, these men are professional hosts working at local, commercial television stations. Their job security is based, like any network program, on ratings and viewership. This is no easy feat when one takes into account the movies that are available to them, and the fact that most people can readily access these same films from Netflix or the $1 DVD bin at Walmart. Another emerging group of hosts are comprised of those who have taken their shows into the new age via weekly web casts. Classic host, Count Gore de Vol, has evolved into this medium. This year’s Rondo award winner for “Best Horror Host” has been presenting movies since the 1970’s. Consequently, he has developed a huge following of fans, one of which created an amazing documentary EVERY OTHER DAY IS HALLOWEEN. While watching that movie, I found it so fascinating that while I was enjoying the Son of Svengoolie in Chicago, kids my age in Washington DC were sharing the same devotion with Count Gore de Vol. Representatives from all facets of hosting were represented at the Vampira Tribute. There was, however, one glaring exception. As I checked the Horrorhound website, I noticed that Svengoolie was not listed as one of the attendees. I started feeling like I was being disloyal celebrating horror hosts without my favorite one being present. 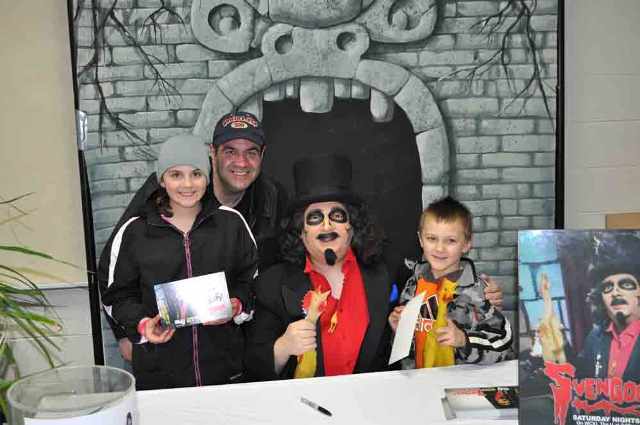 As fate should have it, Svengoolie was making an appearance at Chicago’s Brookfield Zoo the day before Horrorhound. As a volunteer of the zoo, I had planned on attending the event anyway (raising money for “Vital Grounds” an organization dedicated to obtaining land for grizzlies) only to have my worlds collide with the announcement that Svengoolie was going to be our guest of honor. Visiting Svengoolie the evening before Horrorhound at Brookfield Zoo! I had met Rich Koz numerous times since 2003, but this visit was a bit different than the norm. This time I was seeking the blessing of my patron host, to fraternize with his peers (yes, folks, I was raised Catholic). 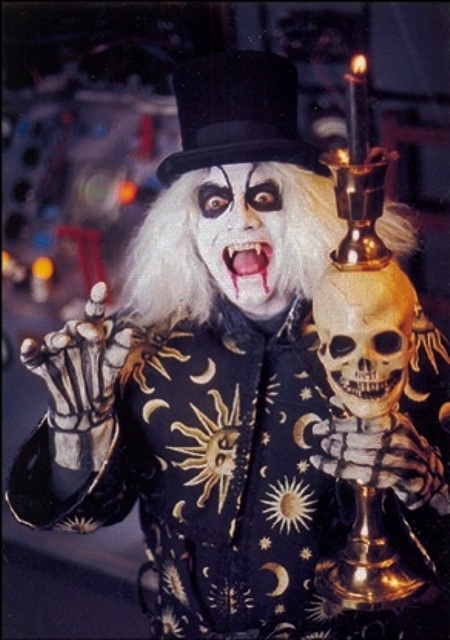 I researched some of the hosts attending Horrorhound and discovered that Penny Dreadful and Doktor Goulfinger were both fans of Svengoolie. When I met Rich at the zoo, I asked him if he wouldn’t mind signing one of his WCIU promo cards for these two hosts. I clenched my teeth, half expecting him to yell “TRAITOR!” while flicking the cards back at me. Instead, he was very happy to oblige. He instantly knew who both of these hosts were and I could tell by his facial expression that he liked them. He also told me he was sorry he was unable to attend the Tribute and wished me a great time. Phew! This entry was posted in Convention & Expos, Horror Hosts and tagged American Scary, BROOKFIELD ZOO, Count Gore De Vol, Doktor Goulfinger, Every other Day is Halloween, HORRORHOUND WEEKEND, Maila Nurmi, MICHAEL MONAHAN, Svengoolie, The Giant Gila Monster, Vampira, Vampira Tribute, Wolfman Mac, Zomboo. Bookmark the permalink. ← 2010 Indianapolis Horrorhound Weekend: A Zombie Paradise!